Doctor Riley Taylor, son of William Carroll and Sarah Sephronia (Evans) Taylor, was born in Winston County on December 3, 1894. He was their seventh child. After his birth, 3 more Taylors were born to Carroll and Sarah. As a child, Dock lived with his family on Byler Road. 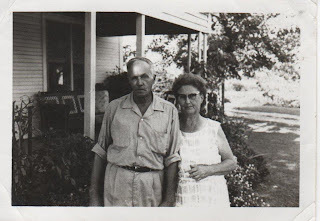 When he was 19 years old, he married May Bell Hood. She was 17. By 1917, he was living in Ashridge. On his World War I Draft Registration card, he described himself as tall, slender, blue eyes and black hair. He and May Bell had one child when he registered for the draft in 1917. In 1930, the family was living in Lynn according to the federal census record. Dock and May Bell had three children--Rosalie, Lenora and Myla. Lenora was also recorded on census records as L.V. It has been said that L.V. was told later in life that she couldn't fill out a form with initials only, so she named herself Louise Virginia. Rosalie married Oda Joe Martin. They had 3 children--Carolyn Jo, Hannah Jean and Roger Lee. Lenora married Mr. Grace. Myla married Mr. Beechum. Dock died on March 17, 1971 at the age of 76. He is buried in Lynn Cemetery, Lynn, Alabama. His wife, who died on October 23, 1983, is buried alongside him.